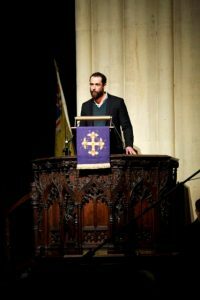 Review of the And There Was Light world premiere at Bath Abbey, by David Grierson from Fine Times Recorder. IT hardly seems two years ago that I had the privilege of attending the premiere of Jools Scott’s and Sue Curtis’ oratorio The Cool Web in the magnificent surroundings of Bath Abbey. Based on the work of Robert Graves, The Cool Web was without doubt one of the most moving tributes to the fallen I had encountered, and as a consequence, I was looking forward to the premiere of their new oratorio, And There Was Light, with no little anticipation. But to begin at the beginning, the oratorio was preceded by, for me at least, an unexpected bonus in the form of some carols featuring not only the Abbey’s boys’ and girls’ choir but also the delightful Melody Makers, their choir for six to eleven year olds. Under the direction of Acting Director of Music Shean Bowers, who clearly enjoyed a really great relationship with the children, we were treated to some superlative singing to start the evening off. I loved the attention to dynamics and articulation in Carol of the Bells, the opening motif of which was to feature so strongly in the oratorio to follow, the utterly charming Babe of Bethlehem, and the opportunity of joining in a number of carols and enjoying David Willcocks’ familiar descants soaring and echoing up to the heavens. The second half of the evening was the And There Was Light world premiere. Beginning with the creation, the oratorio takes the audience from advent to the nativity, the visits of the shepherds and wise men, to Herod’s rage, the slaughter of the innocents and Simeon’s last breath, before ending, full circle, with the Word. Written for narrator, choir and chamber ensemble, the work was commissioned by Shean Bowers and the Abbey Choirs of Boys and Girls and featured both groups along with the Melody Makers, members of the excellent Bristol Ensemble and narrator Tim Delap who delivered the familiar words of the King James Bible with such authority, richness of tone and vitality. Alongside two specially written carols, Nativity and Winter Lamb, Jools Scott and Sue Curtis had selected and arranged a number of well-known carols to illustrate the biblical text so that, for us, the audience, we were on pretty familiar ground and able to enjoy the composer’s new settings, with their unexpected chord progressions, rhythms and subtle orchestrations as well as the glorious singing of course without being overly distracted from the meaning and message of the words. It worked beautifully. The repeated bells motif, for example, added a real sense of urgency and anticipation to the opening carol (O Come, O Come, Emmanuel). It also reminded me very much of one of my own Christmas favourites, the setting of the same melody by Anne Dudley. 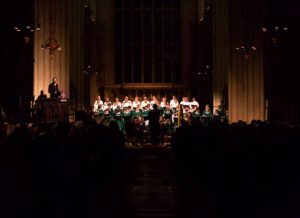 though – the truly uplifting setting of the Nunc Dimittis (Lord, now lettest thou thy servant depart in peace), and those words from Ecclesiastes which end “a time to mourn and a time to dance” which, in Scott’s score, lead straight into a lively setting of the Sussex Carol (On Christmas night all Christians sing). what could well become a Christmas classic. Thanks to David Grierson from Fine Times Recorder for such an encouraging review of the And There Was Light world premiere.